A short trip to Seville in early December enabled a long-time wish to visit Andalucia. Of course we enjoyed the popular attractions of the city - wandering the winding, deeply shaded streets of the historic Barrios (districts); ascending spiral starircases to survey the city from the cathedral roof; watching sunset from the snaking walkways on top of the giant timber lattice of the Metropol Parasol, the largest wooden structure in the world; and of course drinking chilled fino sherry and eating fabulous tapas. But the most magical and inspiring discoveries for me were some of the city’s historic houses, palaces and gardens. Seville was conquered by the Moors in 712 and Sevilla developed into the capital of the region they named Al-Andalus. After the Christian reconquest in 1258, the city became a favoured residence of the Spanish monarchy. At this time the Mudéjar style developed across the Iberian peninsula, a symbiosis of building and decoration techniques where Moorish and European cultures met. The style featured elaborate tilework, brickwork, wood carving, plasterwork and ornamental metals that were geometrical in character, distinctly influenced by Islamic traditions. 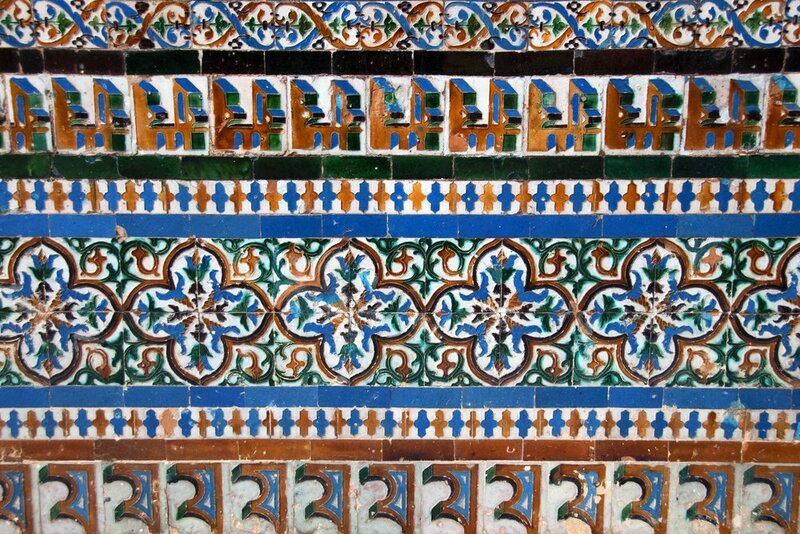 To enliven the surfaces of walls and floors, Mudéjar style also developed complicated tiling patterns. 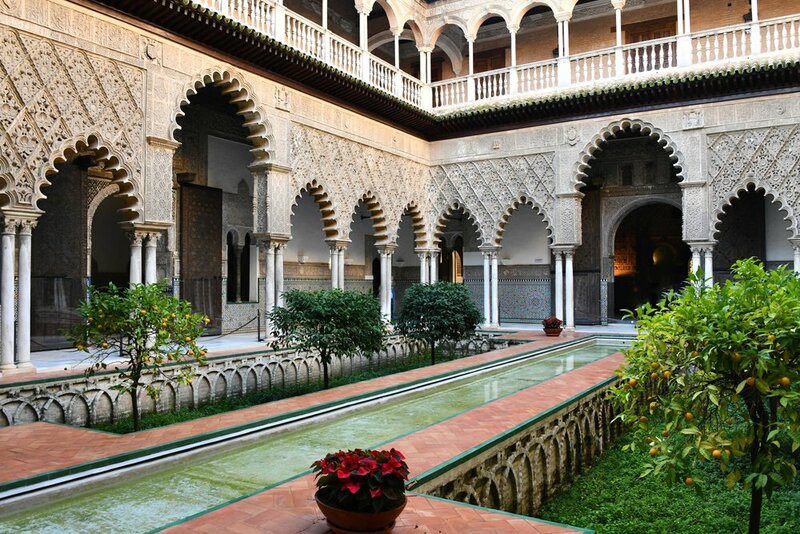 The Moors also left their influence through the significance of water in gardens and the Andalucian patio - tiled, plant-bedecked courtyards often with a central fountain. We stayed at Las Casas de la Juderia, in the heart of the Jewish quarter. We chose here for its horticultural and architectural delights as the hotel comprises 27 historic houses, all linked by 40 patios, gardens and a labyrinth of small passageways. Roman statues, amphorae, earthenware jugs, antiques and historic furniture decorate every charming courtyard and a multitude of plant-filled pots hang from the many balconies. As the hotel boasts, getting lost in this labyrinth of secluded gardens and alleys - some of which were once main roads - is one of the best pleasures that can be enjoyed here. Our first introduction to Seville’s Mudéjar architecture was the Palacio de las Dueñas, the Palace of the Dukes of Alba, built in the late 15th century in the Renaissance style with Gothic and Moorish influences. The Duquesa de Alba, who passed away in 2014, was one of Spain's most famous aristocrats and one of Seville best-loved personalities. With palaces and castles throughout Spain, Cayetana was happiest in her home here in the historic city centre. The house is now owned by her eldest son, Carlos Fitz-James Stuart, 19th Duke of Alba, who officially opened it to the public in March 2016. The palace was originally fitted with eleven patios, nine fountains and over 100 marble columns. 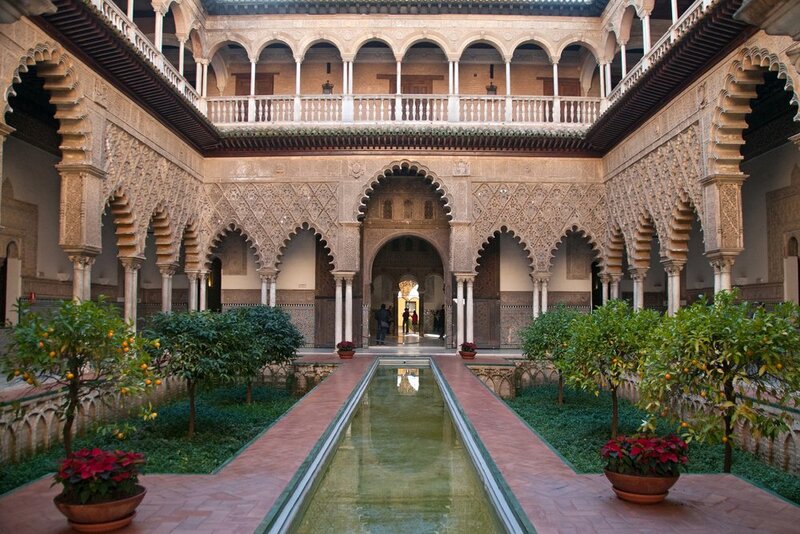 Of these, one patio remains, surrounded by a gallery with columns and displaying typical Mudéjar features including intricate azulejos (ceramic tiles), plasterwork and artesonado wooden ceilings. The patio is divided into four parts with a central fountain in keeping with traditional Islamic style. Poet Antonio Machado lived in the palace during his early childhood, his father serving as the Duke of Alba's caretaker. He wrote "My childhood memories are of a patio in Seville, And a bright orchard where a lemon tree ripens." A series of external gardens display a vast collection of plants including an ancient Cycas revoluta (Sago palm from Japan) and a Cassine orientalis (Bois d’olive from Mauritius). The spectacular bougainvillea facade is an icon of the Palace. The Real Alcázar is one of the world’s oldest royal palaces still in use and has the largest late-medieval garden in Europe. A fortified palace was probably founded here in the 8th century on the site of Roman barracks, which was expanded in the 11th century to become the great court of the Abbadid dynasty. In the 12th and 13th centuries it was developed into a vast citadel by the Almohads. The present structure dates almost entirely from the Christian period following the fall of the city in 1248. The crown jewel of the complex is the Palacio de Don Pedro I who ruled from 1350-69. The buildings he commissioned offer some of the best surviving examples of Mudéjar architecture. King Pedro, though at odds with many of his fellow Christians, had a long-standing alliance with the Muslim emir of Granada, Mohammed V, who was responsible for much of the decoration at the Alhambra. Mohammed sent many of his top artisans to assist with the building of Pedro’s new palace in 1364. These were joined by others from Seville and Toledo. Their work, drawing on the Islamic traditions of the Almohads and caliphal Córdoba, is a unique synthesis of Iberian Islamic art. 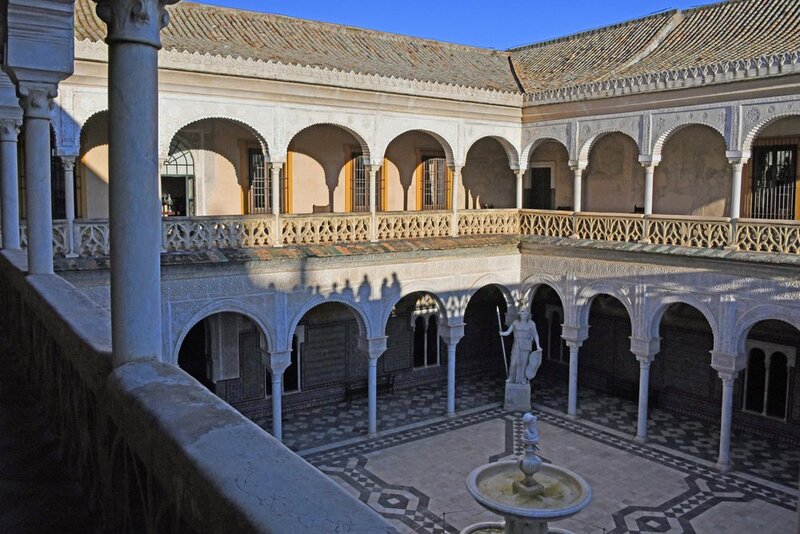 At the heart of the palace is the sublime Patio de las Doncellas (Patio of the Maidens). With its beautiful arches, plasterwork and glazed tiles it is the epitome of Mudéjar style and its sunken garden is the most pure surviving Islamic-style paradise garden at the Alcázar. Born in hot climates, the Islamic paradise garden was an oasis with flowing water, full of fruits and green with lush shade and fragrant plants. Layout and decoration is rhythmic, balanced and geometric, mathematical order underlying its design. Here the central rill reflects light like a mirror. Guests would have entered the protected, inward-looking, shaded court to be met by the scent from the orange trees, a truly immersive experience. Displaying order, proportion and harmony, these paradise gardens were the meeting place between heaven and earth. Surrounding rooms feature stunningly beautiful ceilings and wonderful plaster and tilework. 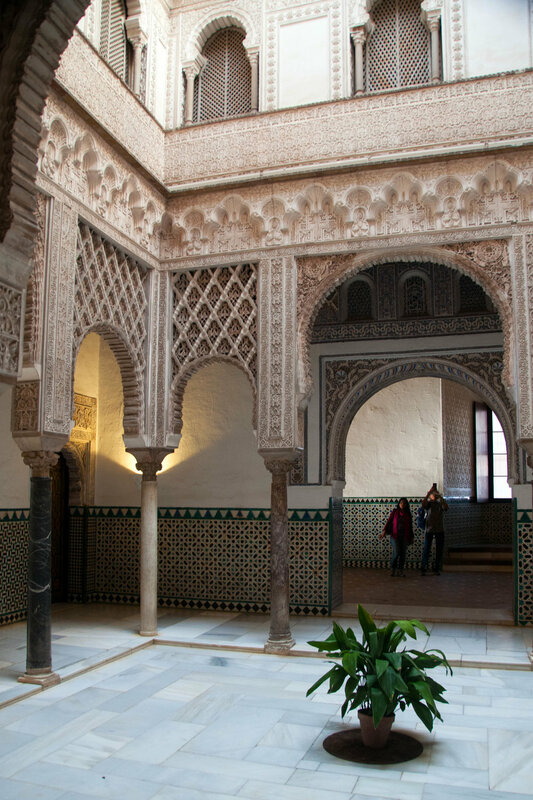 The covered Patio de las Muñecas (Patio of the Dolls), the heart of the palace’s private quarters, features delicate Granada-style decoration; indeed, plasterwork was brought here from the Alhambra in the 19th century, when the mezzanine and top gallery were added for Queen Isabel II. The Cuarto del Príncipe (Prince’s Suite) has an elaborate gold ceiling intended to recreate a starlit night sky. The most spectacular room in the Palacio is the Salón de Embajadores (Hall of Ambassadors). This was originally Pedro I’s throne room, although the fabulous wooden domed ceiling of multiple star patterns, symbolising the universe, was added later in 1427. The dome’s shape gives the room its alternative name, Sala de la Media Naranja (Hall of the Half Orange). Decorative grilles, another feature attributed to the Moors, provide vistas out into the lush plantings of palm, cypress, myrtle, mulberries, magnolia, orange and lemon trees. The adjoining Patio del Crucero and courtyard of the Casa de Contracion both feature a co-axial plan. Islamic gardens were traditionally divided into into four, representing the four seasons and the four rivers of milk, honey, water and wine. At the centre of these gardens is a fountain leading to four rills, water being a symbol of life as well as cooling and dampening the air and providing musical sound conducive to contemplation. The raised pathways enable rain to drain onto the sunken gardens, drying the paths and irrigating the soil. Small trees like the current oranges would have their canopy at eye level, enabling passers by to smell the flowers and easily pick the fruit, again an immersive experience. Beyond the palace, the gardens have evolved from the original Moorish, enclosed, intimate courtyards to a series of gardens designed for courtiers to parade. 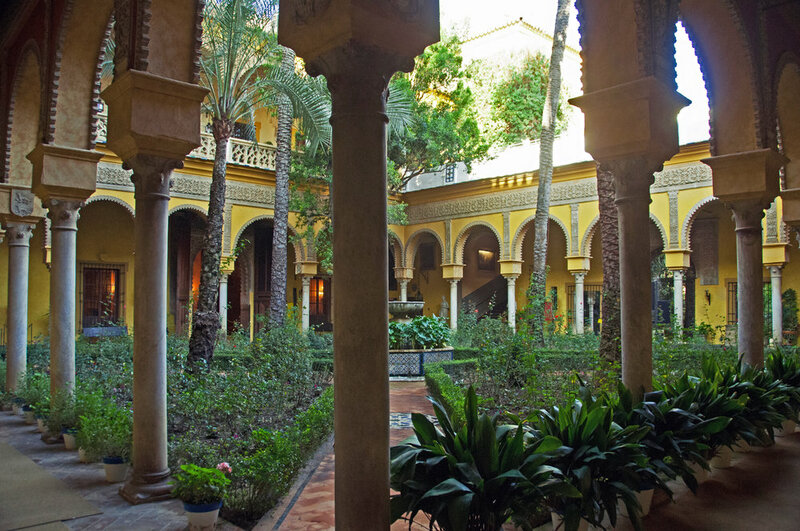 The gardens were added to in the Sixteenth Century, at a time when Seville was the richest city in Spain. Carlos V's designers were influenced by Renaissance styles when making a large labyrinth and a fine pavilion covered in glazed tiles in the 1540s. During the reign of Felipe III the Italian designer Vermondo Resta introduced the Italian Mannerist style, including transforming an old palace wall into an encrusted and embellished loggia from which to admire the view of the palace gardens. Modest bubbling fountains became grand and ornate and under Felipe V the Estanque de Mercurio water feature, once a Moorish reservoir, was re-imagined as a stream of water jetting dramatically from the roof onto the pool. A New Garden was made in the early twentieth century. Like Arts and Crafts gardens elsewhere in Europe, its designers drew upon the national style of the locality. Its plan resembles a glazed tile. Our final visit was to one of the finest of Seville’s mansions, the Casa de Pilatos. It was built in the early 16th century by the Marques de Tarifa of the Ribera family on his return from a pilgrimage to Jerusalem. The house was popularly, and erroneously, thought to have been an imitation of the house of Pontius Pilate, supposedly seen by the Duke on his travels. In fact it is a harmonious combination of Mudéjar, Gothic and Renaissance styles and is particularly known for its huge array of azulejos (glazed tiles), a stunning 16th century tiled staircase with gilded dome roof and the best patios of a domestic house in the city. The central Patio combines Islamic elements such as arches, plasterwork and glazed tiles with Gothic tracery on the upper balustrades and an Italian Renaissance fountain and columns below. Imposing classical statues grace each corner – most are Roman but Athene is attributed to the 5th Century school of Greek master Phideas. The Jardin Grande is a verdant oasis with palms, pavilions and an abundance of orange trees. Local tradition relates that the ashes of Trajan were obtained by the first Duke of Alcala and displayed in a vase in the library. Later, a servant tipped them into the garden believing the vase to be full of dust. Legend grew that an orange tree sprouted from where the ashes had fallen. Seville provided a magical place for our short winter break. I shall always be inspired by the spectacular tiles, carved wooden decoration and plasterwork and the incredibly tranquil and atmospheric patios – each a little piece of paradise.